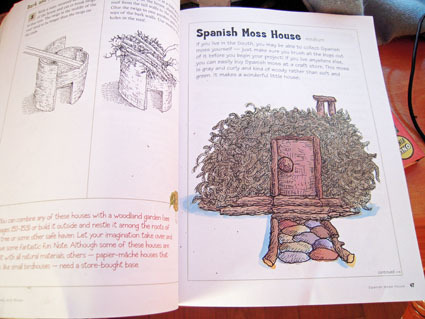 We were reluctantly roped into this adventure by an unrelenting 5-year-old, that spent a little too much time looking at the suspiciously hand-drawn (note that the author had no actual pictures) of 3-d sculptures made from sticks and moss in the book Nature’s Art Box. By the end of two hours, however, each one of us were privately engulfed in a world that revealed the challenges that architects and engineers must face daily, with a fleeting glimpse into the magical world of miniature, where toads, bugs and maybe fairies habitat our world right along beside us. “I wonder who just might live here?” Certainly not a frog, I was reminded; toads like dry places just like this. I’m holding out for the fairy. 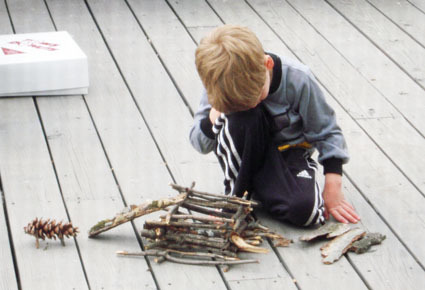 I built three houses out of sticks. Each developer had grand plans, but was unable to integrate a vision into their designs. As Mom, I was called in for help. After all, this was all my idea. One house was small and tight, but had no door. Another was covered in moss. All of them had a walkway crafted out of bark and stones. We used glue to hold everything together; next time we’ll use waterproof glue. 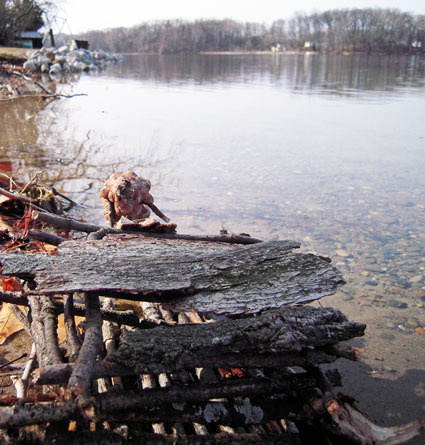 The Lincoln-log style of architecture of layering sticks on one-side then the other seemed to be the easiest method and created the most stable of all houses. 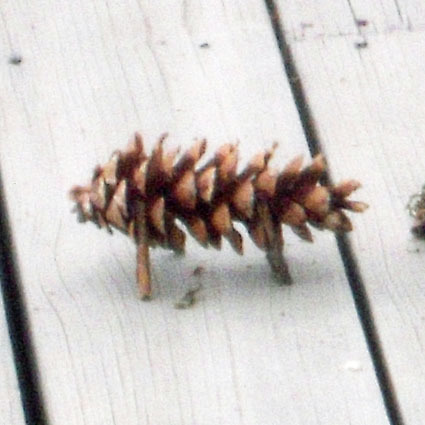 At the five-year-old’s urgings, we created a porcupine from a pine cone. 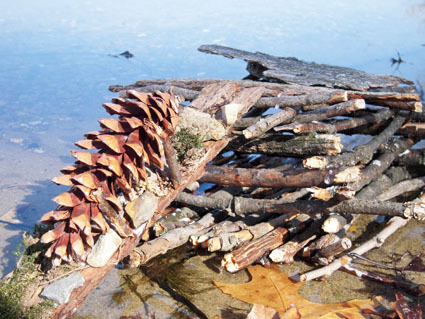 As the structures grew in stature, we went scrambling through the yard for more sticks; looking for just the right fatness, sturdiness, and as much streamlined-straightness as Mother Nature could provide. My favorite house is this one made from moss. Because of, and not in spite of, its smallness, this one has a sense of genuineness – I was expecting a grasshopper to answer the knock at the door any second. Yet, these curly-ques of moss suggest magic; as if there is someone real inside who will walk out with a bowl of apples and commence the fairy tale; one we’ve already heard a million times. I think it’s the door frame that gives it that authenticity. Although crudely glued, the door looks real enough to open from the inside. The acorn shell doorknob doesn’t hurt the fantasy. As I became deeper engrossed in gluing, I thought about all of the times in my life I have passed up opportunities just like this. How many times was I asked to “pick up the sticks” so my parents could mow the lawn, and I stopped at just one? I had no idea then, what I was missing. 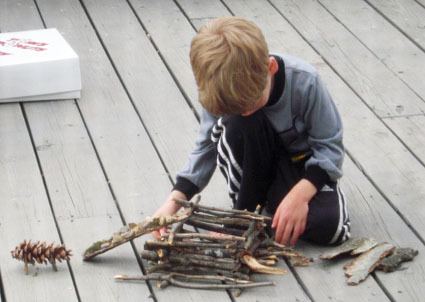 How could I have foreseen just how engaging and fun it could be to build structures out of sticks? 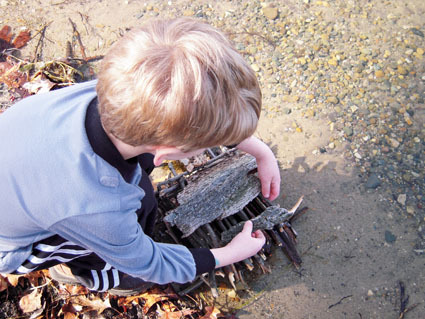 To think, that for years, I have been shelling out tubs of Lincoln Logs to my sons, and feeling as if I was such a good Mom to give them something so natural to play with, using wooden toys, rather than plastic. These natural sticks require you to eye the length, and snap a stick in just the right spot so that it will line up somewhat evenly with the other sticks. 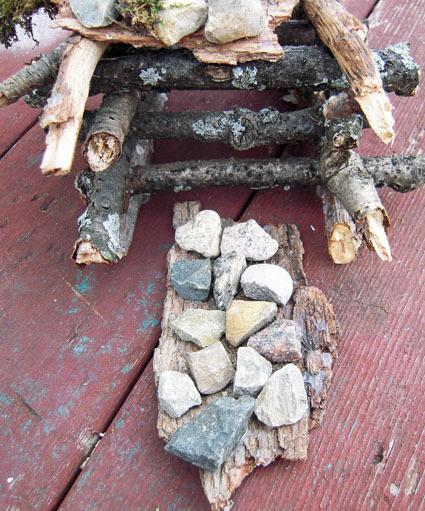 Lincoln logs don’t require you to re-evaluate your roof placement because one side is lopsided. Built correctly, following and staying with in the guidelines, Lincoln Logs will yield exact corners and the exact-height walls, every time. These houses have nothing of the sort. There probably isn’t a park, backyard or sidewalk in the world that isn’t littered with some kind of stray sticks, pieces of bark, and, of course, moss. These toys, tools, are available to anyone anywhere; and they create a satisfaction that I have not felt for a long time. Since we put the glue away, I have caught myself more than once, imagining a picnic table, with acorns as plates. As soon as summer brings us flowers, I’ll be adding a bit more embellishments to these houses. Because, that is one thing the boys won’t think to add. Love this post. 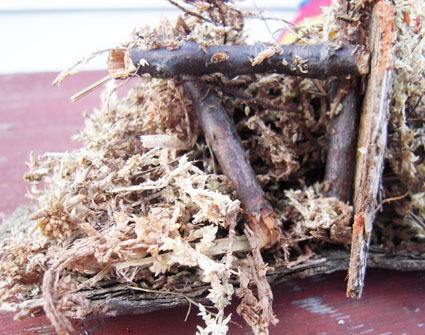 Can’t wait to make worm condos and fairy cabins. Your blog is one of my very favorites… Growing up playing like this, this was a blog for my heart!!! That looks like all sorts of fun! 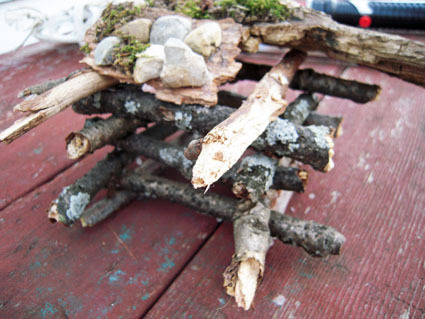 I’m glad that, with your busy schedule, there is still time for building fairy and toad dwellings. P.S. – The first batch of seeds are well-sprouted! I’ll put up a picture soon.